Welcome to my blog about my life in France. My name is Rosemary Kneipp and when I started blogging, I used the pseudonym of Fraussie Grouet. 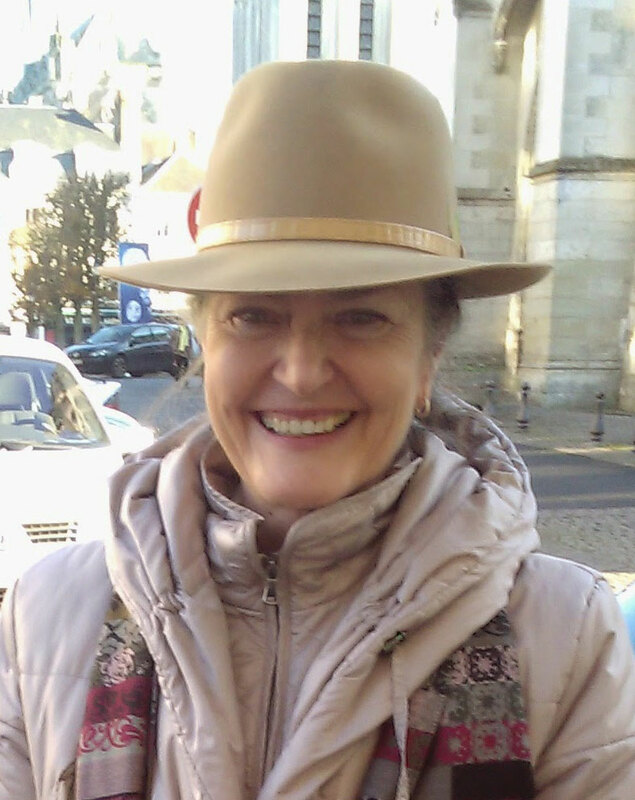 I’m an Australian-born translator from Townsville, North Queensland, living in France since 1975. I love sharing my experiences of living in France and showing friends and family the things I like best, initially in my neighbourhood in Paris – the 1st arrondissement, right next to the Louvre and the Palais Royal – and now in the Loire Valley where we moved at the end of October 2014. I have a second blog called Loire Daily Photo with captions in French and English. I hope my information on the places I visit will give a new perspective to your travels. I blog somewhat intermittently, including insights into living in France and the places I travel to and reflections on the French language in Friday’s French. I have a French husband called Jean Michel (Relationnel in earlier posts). All our kids are grown up. My son and daughter are called Leonardo (IT expert now living in NYC about to move to Boston) and Black Cat (communications & marketing manager working in New York with a sewing blog called NewYorkParisNeedle). My twin stepsons are called Forge Ahead (medical intern) and Thoughtful (a dedicated greenie). We had an Aussie exchange student from Sydney in 2011-2012 called Brainy Pianist who features in some posts during that period. I stopped using pseudonyms in January 2013 after I stopped teaching at the university (see post below). In 2012, we bought our house in the Loire Valley – Closerie Falaiseau – built in 1584 and moved there at the end of October 2014. We rent it out for a month or so each year and also use it for home exchanges mostly to European cities. Apart from reading, writing and travelling, my main interests are language, cycling, wine, mushroom picking, gardening and architecture. I also practise the 5:2 fast diet (also called intermittent fasting). All photos are my own (unless stated otherwisse) and taken with a 5S iPhone. Don’t hesitate to leave comments (in French or English) and I’d love you to join me on Facebook, Twitter, Instagram and Pinterest. You can also subscribe to be notified of new posts by email or use RSS feed. I sometimes use pseudonyms, but feel free to use your real name or a pseudonym yourself. Facebook in particular is a wonderful way to interact with other people with the same interests and learn about other blogs you might like to read. You’ll also find more details about places to visit, eat and stay. The blog is called Aussie in France (pronounced Ozy) because that is the name Australians give themselves. Fraussie = FRench Aussie and Grouet is the area of Blois where our house is located. Hi, Am I right in thinking you are moving to Blois? I live just outside the city centre and work in a restaurant on the main pedestrian street, so maybe we will bump into each other. PS, I am English if you hadn’t guessed! Thanks Jon. You guessed right. However, we won’t be moving there for another 2 1/2 years. This sentence describe my home. It was built in 1989.If you have the opportunity to come back in Mesnil Jourdain and if you are interested you can meet me so I can show you the pictures of the building. Hi, I’m from Australia and my husband’s French. We have been going to the Jonquez’ gîte for the last five years for Christmas and really love Le Mesnil Jourdain. However, we’ve found our own house in Blois now so may not be back. Thank you for your offer. How did you come across your house on the blog? As someone who would like to (re)visit Paris one day, I found this tongue-in-cheek guide extremely helpful. Now I know which areas I’d pick to unpack my bags, which is priceless info indeed. Thanks, Lisa! Fraussie, I’m guessing is French Australian? If not, I like the idea that it is. But what is Grouet? Of course as a Nom de Plume you have no reason to tell your readers. And what fun the names of all of your family. I’ve just come across your blog because Bruce and his wife Veronique were just on one of my treasure hunts at the Louvre. Lovely write up of him. I look forward to going on one of French Mystique Tours, too. As you live just between Palais Royal and the Louvre, I just wanted to let you know of THATLou (Treasure Hunt at the Louvre). If it sounds like it could be fun, please join one. And regardless, I hope to meet you one day. Wonderful blog, thank you. Hi Daisy, glad you like my blog! You’ve guessed right: Fraussie is French Australian and Grouet is the neighbourhood of our new house in Blois. Actually, had I known that the house was called Closerie Falaiseau, I would have chosen Fraussie Falaiseau but it’s a little late now. Please can you explain a little about THATlou. I’m a great fan of the Louvre. The first year we lived in the Palais Royal we had a yearly ticket and spent the whole year just discovering the architecture of the building. Also I’ll feature you on my Wednesday’s other blogs post. I’m sure lots of my readers will be interested as well. That’s very kind, thank you! I would be honoured to merit a post, but after you’ve been on one. I don’t know if you’re around on Sunday (You’re probably at Closerie Falaiseau for the Pont), but THATLou is having a treasure hunt at 2.30 that you’re more than welcomed to join. It’s part of the Sunday series, which is the first Sunday of every month. Knowing that you studied the architecture of the Louvre for a full year, you will certainly win the next THATLou! I came to your blog, though, to find your email address, so will do that and continue there. Had just wanted to stop by to see how your tweet up went. Was sorry to miss meeting you all. Thank you very much for the offer but we are going to Closerie Falaiseau as you guessed. Hope to make it another Sunday though. Hello. I just saw your comment on my blog. I don’t think we are neighbors, but I do love your part of town. Let me know if you’re ever looking for some Wednesday content. I’d be honored! g’day from a beautiful Brisbane autumn Sunday. Breakfast in the garden with Jane W and Jane J … all of us planning for our 2012 European Adventure. … and me, looking forward to lunch under the trees in the Tuileries on a sunny Paris afternoon. It’s a date! Let’s just hope the sun arrives. Hi Lyn! Let me know exactly when you’re coming so that we can meet up. We’ll have a mini SMM meeting! If you use the search function on the blog, typing in Paris, you’ll have lots of suggestions of places to see. In particular, my Powerwalking series should give you lots of ideas. Another blog, http://femmesfrancophiles.blogspot.fr, have lots of unusual places as well. When I first arrived in France, I lived not far from Lourdes. For your accommodation in Paris, why not try a B&B (or an apartment). It’s a great way to visit the city. Petite Paris has many suggestions on petiteparisbedbreakfast.blogspot.com. Let me know if I can help in any way. Jane J. who often makes comments on the blog is also from SMM and is visiting the north of France this summer. I’m sure she’ll have many tips as well. Hi Fraussie! I was browsing through your blog and found myself so envious of your travels and wonderful discoveries all throughout France. I am trying to make it back there myself. Perhaps you, or someone you know would have some suggestions or opportunities in mind. I would appreciate it! Hi Katie, getting work and a work permit in France are very difficult. One of my American translation graduates has just been sent back to the States despite the fact that she was working and her employee was willing to look after the paperwork for her to stay. The government refused anyway. You could try looking into the French assistant programme http://www.ciep.fr/assistantfr/. It would only be for a year, but that might be better than nothing! Good luck. I’m a Brit/Dane/French living in California with one year in Belize, and 6 years in Nigeria as a child. I just came back from Paris where my father lives and where I lived for 14 years growing up. I’m married to an American and as I get older, I love retunring to my roots. Australia is next on my list to visit. Hi Sonia, you’ve certainly been around! Look forward to reading about your adventures and perhaps we’ll meet up in Paris some time. That would be fun as I go back to Paris, at least once a year. I just met Muriel, a French blogger, who lives in London. I love love LOVE your blog! It makes me feel so connected to France, I am so homesick for a country I have never lived in!!!! Hi Claire, I’m so glad you like my blog! Maybe you were French in another life! This is quite something. You are an Aussie, married to a Froggie, know and love Tassie, love wine and have an attachment near Blois. So do I! I live just next to Gigondas (in Sablet) and write mostly about wine. Hmm. How many degrees of separation here? Hi, just stumbled upon your blog, you have beautiful photos in France! Thank you! I went to India several years ago, but only for a week on a teaching assignment to Chennai. There are so many places in the world to go! hi I am aussie living in france. Thought they were extinct birds. Here in Normandy we r.Have come over nearly 3yrs now. Great reading. keep spirits up. Neighbours r neighbours no matter what country. Hi Trish, we’re not extinct, I assure you! We’re just scattered around the country, though probably more concentrated in Paris. Where are you in Normandy? Just found your blog from Facebook, really enjoying the read. We have only been here for just over a year. We are renovating a house in Brittany. Hi Jenny and John, thank you for your comment – and good luck with the renovations! We’re in the throes of building an upstairs kitchen at the moment and other things keep getting in the way. Hey! Stopping by from the SITS tribe 🙂 I’m so happy to have found your blog! I LOVE Paris and just visited this past October. Hi Erica, thanks for stopping by. So glad you enjoyed your stay in the city of light! I found your blog because I’m planning a bike trip to Lake Constance, and found your post about that. In the post, you mentioned Magnetic Island…I had to come to the “About” section to see if you were from Townsville, and it turns out that you are! I lived in Townsville for 6 months, but I’m American. Great to meet you! Hi Becky and welcome to Aussie in France! What a coincidence that you know Magnetic Island and lived in Townsvilel for 6 months. I hope you have a wonderful time on Lake Constance. Can definitely recommend our hotel at Moos. Hi Gilda, I guess Rosemary is a good name! The Loire Valley is a truly beautiful region. You’ll have to visit sometime and see for yourself! I am a French-Australian (queenslander born in France) and just found your blog, which I am really enjoying. I am still trying to figure out life in l’Oise for the last two years, after being born in le Val d’Oise but having grown up in Brisbane and the rest of the world. I’m having such a hard time finding my feet culturally and professionally, and reading your blog I really admire how you have “integrated”, especially in la vallee de la Loire. I have a PhD in geopolitics from ANU and still can’t get even a secretarial/assistante de direction job in l’Oise/ the Paris area. Anyway, will continue to enjoy reading your blog now that I have found it! Terrific photos by the way. More food photos please! Bonjour Christine, I can well imagine that l’Oise does not give you many professional opportunities! What has brought you back to France? Are you at least in a town rather than in the countryside? If you are on Facebook, you might like to join the Aussies in France group (nothing to do with my blog but a friendly group of people). It might give you some more contacts.